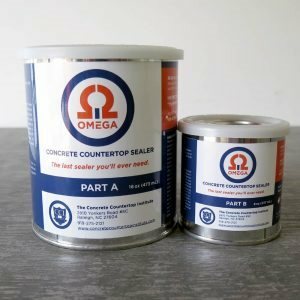 Formulated specifically for countertops, Omega Concrete Countertop Sealer provides superior protection. Because concrete is naturally porous, concrete countertops should always be sealed to protect them from food stains, scratches and water absorption. The right sealer will not only protect the countertop surface, but also enhance its color and sheen. There are many factors to consider when choosing a countertop sealer. Following are some tips for selecting a product appropriate for the function and design intent of your countertop. For countertops, be sure to choose a heavy-duty sealer that is food-safe, colorless, non-yellowing, and heat and scratch resistant. Learn more about polyaspartic sealers for countertops, which resist heat and are impervious to lemon juice and red wine. In most cases (with the exception of outdoor countertops), you’ll be applying the sealer indoors. Use a product that is safe for indoor application, one that contains no VOCs or harmful chemicals and is low in odor. Countertop sealers are available in a range of sheen levels. For a more natural look, you’ll get the best results using a sealer with a low-sheen matte finish. If you want a shinier porcelain-like finish, choose a high-gloss sealing product. Most countertop sealers can take hours to become tack-free and several days to reach full cure. If you want to speed up the process, fast-curing sealers are available that cure almost instantly upon exposure to a special ultraviolet light. Learn more about a countertop sealer that offers instant curing. Be sure to test any sealing product you’re considering before you apply it. Testing is the most accurate way to verify that a countertop sealer will deliver what you expect in terms of both appearance and performance. See this procedure for testing sealers for concrete countertops. How to Apply Countertop SealerHow a sealer is applied can significantly affect the final appearance and performance. Using the right tools is critical to achieving the best coverage rate and sealer thickness. While there are some general guidelines for applying sealer, you should always refer to the manufacturer's installation instructions regarding the tools and procedures they recommend. The most important rule to remember is that less is more. You should apply sealer in multiple thin coats vs. one thick heavy coat. Get more tips for sealer application: Choosing the Best Applicator. For additional protection and luster, some countertop installers will also apply a food-safe finishing wax over the sealer. This sacrificial protectant will help to preserve the sealer but requires regular reapplication to maintain its effectiveness. Fixing Scratches in Countertop SurfacesMinor scratches can occur in concrete countertops by cutting directly on the surface. If scratches do appear, they are usually in the sealer and not in the concrete itself, making them easy to repair (see How to Fix Scratches in Topical Sealer). Minor scuffs and shallow scratches in countertop sealers can usually be buffed out. If the scratch is deep, however, you may need to fix it by filling the scratch with more sealer. For information on the best tools to use to apply touchup sealer, see Touching Up Minor Surface Scratches. 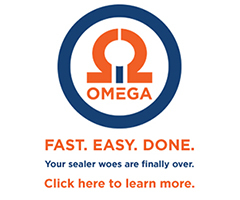 Omega Concrete Countertop Sealer™ The last sealer you'll ever need. Concrete Countertop Kits Sealers, Mixes, Equipment and GFRC.